THIS IS WHERE WRESTLERS BECOME CHAMPIONS. At Athletic Republic, we concentrate on only one thing: better athletes. Ever since we first started blending the science of physiology and biomechanics with sport-specific training more than 27 years ago, we’ve made it our singular quest to be the go-to place for serious athletes. We’ve developed a unique program to specifically train wrestlers to improve their speed, power and agility so they can become not just better athletes, but better wrestlers. Through our evidence-based training protocols and patented equipment, we can improve a wrestlers’ explosive power, strength and stamina to ensure they are making the most of their minutes on the mat. SPEED, POWER, AND AGILITY ARE THE TOOLS OF THE TRADE. At any age, at any level, wrestling is a physically and mentally demanding sport. When a match can be over in the matter of seconds, a wrestler must be able to act and react quickly and decisively. Speed: Gain a competitive edge and develop the skills needed to make sure you’re ready for the takedown. Power: Combined with strength and explosion work, we work on producing reactive power through our plyometric training. Agility: Reacting to your opponent, setting up an attack and defending requires quick movements and being able to change directions in an instant. Athletic Republic is staffed with a team of trainers certified in a unique combination of exercise science, sports training and athlete assessment technology. If you’re interested in gaining a competitive advantage, join us for a 4, 6, or 8 week training program this off-season. Drop-in or call to learn more. THIS IS WHERE VOLLEYBALL ATHLETES BECOME VOLLEYBALL CHAMPIONS. At Athletic Republic, we concentrate on only one thing: better athletes. Ever since we first started blending the science of physiology and biomechanics with sport-specific training more than 27 years ago, we’ve made it our singular quest to be the go-to place for serious athletes. We’ve developed a unique program to specifically train volleyball players to improve their acceleration, agility and power so they can become not just better athletes, but better volleyball athletes. Through our evidence-based training protocols and patented equipment, we can improve an athlete’s mechanics so they rise higher with more hang time giving them more explosive power behind every hit. We also provide exact neurological learning and coordination that improves functional strength and the ability to serve, set, spike, and block. POWER, ACCELERATION AND AGILITY ARE THE TOOLS OF THE TRADE. At any age, at any level, volleyball is a physically and mentally demanding sport. By focusing on power, acceleration, and agility, we can give every middle blocker, outside hitter, setter and libero the tools to be more successful on the court. Power: Attack positions require the ability to change from horizontal velocity to vertical velocity and create explosive jumping power. Acceleration: Volleyball is made up of intense, short bursts of speed. Success or failure is tied directly to an athletes’ ability to increase or decrease speed in just a few steps. Agility: Body control is essential for the development of ball control. An efficient player must be able to shuffle, step, reach, change direction, move backward and jump all while making contact with the ball. THIS IS WHERE TRACK & FIELD ATHLETES BECOME TRACK & FIELD CHAMPIONS. At Athletic Republic, we concentrate on only one thing: better athletes. Ever since we first started blending the science of physiology and biomechanics with sport-specific training more than 26 years ago, we’ve made it our singular quest to be the go-to place for serious athletes. We’ve developed a unique program to specifically train track & field athletes to improve their speed, power, agility and reactions so they can become not just better athletes, but better track & field athletes. Through our evidence-based training protocols and patented equipment, we improve an athlete’s running mechanics and economy while developing acceleration, top-end speed and stamina to help athletes improve on the track and on the field. SPEED, POWER AND AGILITY ARE THE TOOLS OF THE TRADE. At any age, at any level, track & field is a physically and intellectually demanding sport. By focusing on speed, power and agility, we can give every track & field athlete the tools to be more successful. SPEED: Speed is a defining attribute in athletics. No longer considered a genetic gift, speed can be improved by training stride length, stride frequency, power output, symmetry, and stamina. At Athletic Republic our speed training develops acceleration, top-end speed and stamina to help athletes make the most of their speed skills. POWER: Science says POWER = FORCE x VELOCITY. The more force you produce and the faster you do it, is the difference in finishing on the podium or at the back of the pack. If you want to jump higher, throw farther, or move at warp speed the instant the gun goes off, you need POWER. Explosive power for running and jumping is developed by improving rotational strength, stability and symmetry between right and left legs. While throwing power is increased by strengthening the acceleration and deceleration muscles used for every throw or put. AGILITY: Agility hinges on an athletes’ ability to control their center of gravity in all situations and maintaining control of your body while under physical stress. You can be speedy and powerful, but an athlete who is agile or dynamically stable will perform at a higher level with less risk of an injury. 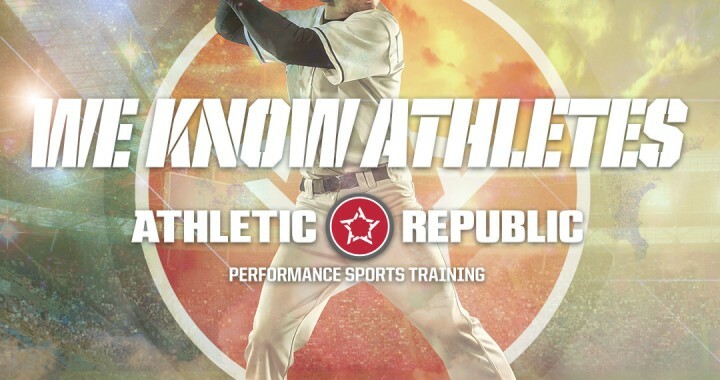 Athletic Republic is staffed with a team of trainers certified in a unique combination of exercise science, sports training and athlete assessment technology. If you’re interested in taking your training program to the next level, we’re ready to help you improve your performance and make next season your best season. THIS IS WHERE TENNIS ATHLETES BECOME TENNIS CHAMPIONS. At Athletic Republic, we concentrate on only one thing: better athletes. Ever since we first started blending the science of physiology and biomechanics with sport-specific training about a quarter century ago, we’ve made it our sole objective to become the go-to place for serious athletes. Our tennis training program caters to the mix of aerobic and anaerobic endurance, explosive strength and power, and agility required for a tennis player to excel through repeated bouts of high-intensity activity. SPEED, QUICKNESS, AGILITY AND POWER ARE THE TOOLS OF THE TRADE. At any age, at any level, tennis is a physically and intellectually demanding sport. By focusing on speed, quickness and agility, we can give every tennis player the tools to be more successful on the court. Speed: Our tennis training improves the speed of muscle contraction to allow the body to execute body movements at an accelerated pace. Quickness and Agility: The speed and agility work performed on our patented Super Treadmill and Plyofloor elevates muscle coordination, footspeed, and movement precision to facilitate that next-level change of direction. Hitting and Leg Power: On average, a 20% gain in peak force and power provides another level to a tennis athlete’s game. Our training programs create faster, stronger, more explosive tennis players who are able to maintain superior hitting power so that they have more shots in their arsenal whether on the baseline or approaching the net. Our Plyo Press Machine (PPM) improves leg strength and explosive power. The footplate angle puts the athlete in an athletic position to produce force through the balls of his/her feet – not the heels. Athletic Republic is staffed with a team of trainers certified in a unique combination of exercise science, sports training and athlete assessment technology. If you’re interested in gaining a competitive advantage, join us for a 4,6, or 8 week training program this off-season. Drop-in or call to learn more. THIS IS WHERE SWIMMERS BECOME CHAMPIONS. At Athletic Republic, we concentrate on only one thing: better athletes. Ever since we first started blending the science of physiology and biomechanics with sport-specific training more than 27 years ago, we’ve made it our singular quest to be the go-to place for serious athletes. One of the latest additions to our training line-up is the development a dry-land program tailored specifically to swimmers to help them improve their speed, efficiency, explosive power and race day results. At any age, at any level of competition, swimming is one of the most physically and mentally demanding sports. By incorporating a pre-season and early season dry-land training program, the swimmer is able to supplement the high repetition, low-resistance work they complete in the pool. Power: Accelerate faster, get off the wall quicker, and maintain top-end speed. Stamina: Retain stroke mechanics under fatigue and increase the number of underwater kicks at each turn. Strength: Build your core, back, and shoulder strength to make the most of every stroke. Athletic Republic is staffed with a team of trainers certified in a unique combination of exercise science, sports training and athlete assessment technology. The Dry-Land Training program has been developed as a series of 90-minute sessions delivered in 5-week training blocks for younger age groups, High School swimmers and as a weekly addition to master swimmers and Triathletes off-season and pre-season work-outs. Drop-in or call to learn more. THIS IS WHERE SOFTBALL ATHLETES BECOME SOFTBALL CHAMPIONS. At Athletic Republic, we concentrate on only one thing: better athletes. Ever since we first started blending the science of physiology and biomechanics with sport-specific training more than 25 years ago, we’ve made it our singular quest to be the go-to place for serious athletes. We’ve developed a unique program to specifically train softball players to improve their speed, power, agility and reactions so they can become not just better athletes, but better softball athletes. Through our evidence-based training protocols and patented equipment, we improve an athlete’s hitting and throwing mechanics, first step quickness and flat-out speed and a player’s anticipation and reaction skills. We also provide exact neurological learning and coordination that improves a player’s ability to hit, throw, catch, pitch and field. At any age, at any level, softball is a physically and intellectually demanding sport. By focusing on speed, power and agility, we can give every softball player the tools to be more successful on the field, regardless of their position. Speed: Softball is made up of intense bursts of speed. Success or failure is tied directly to an athlete’s ability to increase or decrease speed in just a few steps. Power: Hitting with explosive power is developed by improving rotational strength and stability. Pitching velocity is increased by strengthening the acceleration and deceleration muscles used for every throw. Agility: Body control is essential for making a defensive play. An efficient player must be able to shuffle, sprint, reach, change direction, move backward and jump to successfully field a ball. Athletic Republic is staffed with a team of trainers certified in a unique combination of exercise science, sports training and athlete assessment technology. If you’re interested in taking your softball training program to the next level, we’re ready to help you improve your game and on-field performance. THIS IS WHERE SOCCER ATHLETES BECOME SOCCER CHAMPIONS. At Athletic Republic, we concentrate on only one thing: better athletes. Ever since we first started blending the science of physiology and biomechanics with sport-specific training more than 25 years ago, we’ve made it our singular quest to be the go-to place for serious athletes. We’ve developed a unique program to specifically train soccer players to improve their acceleration, agility and power so they can become not just better athletes, but better soccer athletes. Through our evidence-based training protocols and patented equipment, we can improve an athlete’s mechanics so they have a faster first step, can change direction quicker, and have the stamina to play as well in the opening minutes as the closing minutes. At any age, at any level, soccer is a physically and intellectually demanding sport. By focusing on acceleration, agility and power, we can give every defender, midfielder, forward and goalkeeper the tools to be more successful on game day. Acceleration: Every soccer game is made up of hundreds of short bursts of speed. Success is often defined by an athletes’ ability to increase or decrease speed in just a few steps. Agility: Balance, coordination and stability are essential for nearly every movement with or without the ball. A complete player must be able to perform every technique at top speed, while still maintaining control and composure. Power: Change of speed and change of direction are two of the most important soccer skills. By definition, an athlete’s ability to generate power determines how fast his movement occurs. THIS IS WHERE FOOTBALL ATHLETES BECOME FOOTBALL CHAMPIONS. At Athletic Republic, we concentrate on only one thing: better athletes. Ever since we first started blending the science of physiology and biomechanics with sport-specific training more than 27 years ago, we’ve made it our singular quest to be the go-to place for serious athletes. We’ve developed a unique program to specifically train football players to improve their acceleration, agility and power so they can become not just better athletes, but better football athletes. Through our evidence-based training protocols and patented equipment, we can improve an athlete’s mechanics so they have a faster first step, can change direction quicker, and have the stamina to play as well in the opening minutes as the closing minutes. At any age, at any level, football is a physically and mentally demanding sport. By focusing on speed, power, and agility, we can give every player on the field the tools to be more successful on game day. Speed: In order to increase running speed, we’ll focus on building a football player’s hip flexor strength and core stability. Power: Developing single leg strength and explosive power with our strength protocols will help our athletes increase their quickness for faster and more efficient cuts. Agility: Football players need to be able to change direction often and cover a lot of ground quickly. Our plyometric training helps our athletes accelerate faster to make a tackle or outrun a defender. THIS IS WHERE BASKETBALL ATHLETES BECOME BASKETBALL CHAMPIONS. At Athletic Republic, we concentrate on only one thing: better athletes. Ever since we first started blending the science of physiology and biomechanics with sport-specific training more than 25 years ago, we’ve made it our singular quest to be the go-to place for serious athletes. We’ve developed a unique program to specifically train basketball players to improve their acceleration, agility and power so they can become not just better athletes, but better basketball athletes. Through our evidence-based training protocols and patented equipment, we can improve an athlete’s mechanics so they have a faster first step, can change direction quicker, and have the stamina to play as well in the opening minutes as the closing minutes. AGILITY, QUICKNESS AND POWER ARE THE TOOLS OF THE TRADE. At any age, at any level, basketball is one of the toughest team sports to earn playing time. By focusing on agility, quickness and power, we can give every guard, forward, and center the tools to be more successful on game day. Agility & Quickness: On average, our athletes see a 33% increase in foot speed which means a faster first step and quicker cuts. Shooting Accuracy: Basketball players experience an average improvement of 11.5% after completing our PowerCord shooting program. Vertical Jump: 2 – 4” increase in jump height provides the elevation to extend over defenders. Power: On average, a 20% gain in power improves a basketball player’s game on both sides of the ball. Stand your ground on defense and blow through defenders on the offensive end. THIS IS WHERE BASEBALL ATHLETES BECOME BASEBALL CHAMPIONS. At Athletic Republic, we concentrate on only one thing: better athletes. Ever since we first started blending the science of physiology and biomechanics with sport-specific training more than 25 years ago, we’ve made it our singular quest to be the go-to place for serious athletes. We’ve developed a unique program to specifically train baseball players to improve their speed, power, agility and reactions so they can become not just better athletes, but better baseball athletes. Through our evidence-based training protocols and patented equipment, we improve an athlete’s hitting and throwing mechanics, first step quickness and flat-out speed and a player’s anticipation and reaction skills. We also provide exact neurological learning and coordination that improves a player's ability to hit, throw, catch, pitch and field. At any age, at any level, baseball is a physically and intellectually demanding sport. By focusing on speed, power and agility, we can give every baseball player the tools to be more successful on the field, regardless of their position. Speed: Baseball is made up of intense bursts of speed. Success or failure is tied directly to an athlete’s ability to increase or decrease speed in just a few steps. Athletic Republic is staffed with a team of trainers certified in a unique combination of exercise science, sports training and athlete assessment technology. If you're interested in taking your baseball training program to the next level, we're ready to help you improve your game and on- field performance. 24 Hour Gym in DeKalb and Sycamore offers Athletic Republic speed and agility training. To date over 1,000 local athletes have trained at FitWorkz. This includes 100 college athletes and 7 professional athletes.